Job 37:10-13 – By the breath of God ice is given, and the broad waters are frozen fast. 11 He loads the thick cloud with moisture; the clouds scatter his lightning. 12 They turn around and around by his guidance, to accomplish all that he commands them on the face of the habitable world. 13 Whether for correction or for his land or for love, he causes it to happen. 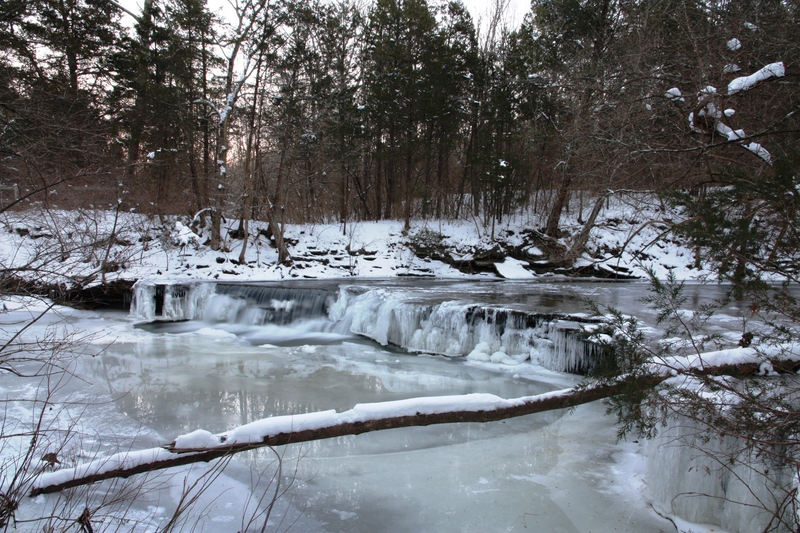 The waterfall on Flat Fork Creek is nearly frozen over with ice after a bout of sub-zero temperatures. Caesar Creek State Park, Waynesville, Ohio. Today’s passage from the book of Job reminds us that God is sovereign over all of his creation, even the winter weather, for “By the breath of God ice is given.” One question often asked by those who doubt God’s sovereignty is, how a loving God can let bad things like storms or natural disasters happen?” Even as Christians we do not always understand God’s purpose behind the events in our own lives, let alone those in the larger world around us. But, as we read here, God is most certainly in control and his purposes are achieved, for the clouds “turn around and around by his guidance, to accomplish all that he commands them on the face of the habitable world.” We also read of some possible reasons behind God’s actions, they may be “for correction or for his land or for love,” even though we may not fully comprehend the reasons at the time. This entry was posted in God is Revealed... and tagged Caesar Creek State Park, Flat Fork Creek, Frozen waterfall, God's sovereignty, Ice, Job 37, Ohio State Parks, Romans 8, Romans 8:28, Snow, Waterfall, Waynesville Ohio, Winter by Todd D. Nystrom. Bookmark the permalink.